As a musher I train all winter to run my dogs in the cold. I love it. I love the feeling of being outside at twenty below with just me and my dog team and the freezing air on my face. It makes me feel alive! 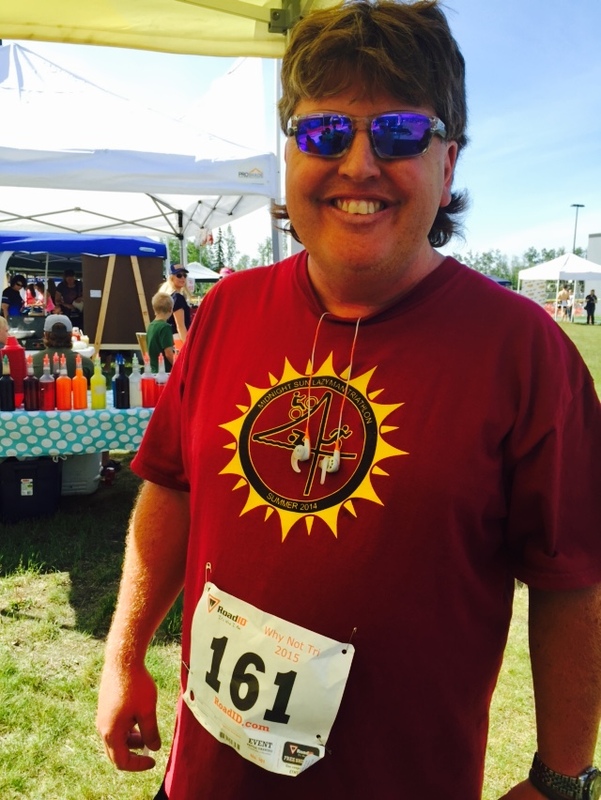 For the past two summers I have participated in the Why Not Tri event that is held in Wasilla. It is what they call a sprint triathlon but for a guy like me, a middle age, slightly overweight, at least by my standards, and having enough injuries from spending my days doing extreme things like sky diving, it is a good event for me. It is just the right amount of each sport to be challenging but not the long marathon that would get me up at three in the morning to go for a run. I had it on my calendar months in advance for the first sign up day online and I signed up. I was the 161st person to do so in what would grow to more than 700 people including the kids and teams. 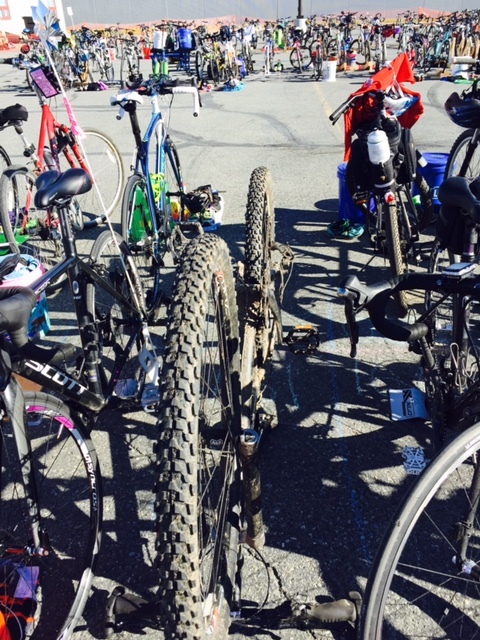 We had to be at Wasilla High School by 8 am to set up our bike and gear in the transition area. I parked near the front (by bib number) and had to flip my bike over on its handlebars because I couldn’t find the cool wooden stand I made last year. Sign in was at 8:30 and the wrote our numbers on our arms and the back of our leg with a Sharpie marker. Then I headed to the pool. Being that I signed up early I had an early swim time this year. This type of triathlon is set up quite a bit different than you would expect. 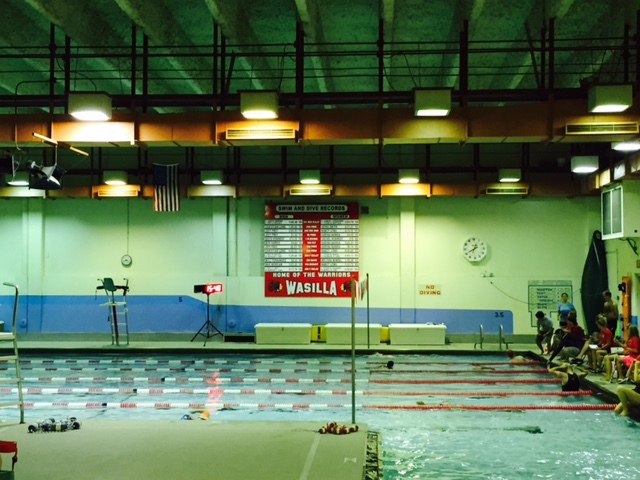 People swim in groups of 50 in an eight lane pool at Wasilla High School. It takes all day for everyone to get through. Last year I didn’t swim until 1 pm because of my bib number. This year I was there early and they allowed us to get in line right away. Last year I made a major mistake and did not warm up in the pool before hand. As soon as I jumped in I got a major cramp in my leg and I had a hard time finishing the laps. I practically backstroked the entire swim event last year. This year was much better. I did a couple warm up laps in the deep end of the pool and felt good when I jumped in for my laps. I am not one of these guys that wears a swim cap and I didn’t even wear googles. My swim shorts were the same shorts I would use for the bike and the run and not some funky skin tight body suit. And no I didn’t shave the morning before the event, either. The swim portion of the event was eight laps up and back, or 400 meters. I did pretty good and proud to say I didn’t cramp up this time. I am in no means a fast swimmer but I kept and even pace and got out of the pool feeling good. I ran out of the school and headed toward the transition area. Here my bike was set up and my gear was ready. I took a few minutes to dry off and headed toward the start of the bike event. I have always been very comfortable on a bike, but anybody that runs a triathlon will tell you that a mountain bike is not the way to go. True this isn’t an ultra-competitve event but I could see the fancy four thousand dollar road bikes were blowing past me like I was standing still. In the transition area I put on my shoes, socks and shirt and gave a quick text to Michele. I told her my swim time was much better than last year and I was about to jump on the bike. I slammed a 5-Hour Energy and put Rob Zombie’s new CD, Spookshow International Live on shuffle. The bike course was 9.5 miles. It takes you out of the high school parking lot, up a decent incline on Wasilla Fishhook then back around to Bogard Road. It kept up a decent pace and enjoyed the ride. The run is always the hardest part for me. While I don’t mind running up hills with my sled dogs to give them a little lighter load, running on pavement kills me. I have a nagging hamstring injury on my left leg and a partially blown out knee on my right leg that happened the last time sky dived way back in 1999. The course for the running portion takes you out of the transition area and you turn left. It is a 5k (3.1 miles). You wind through the trees on a bike path before hitting Wasilla Fishhook Road. Here it is a steady climb for at least a mile. At the corner I grabbed a water and was told by at least eight kids handing out the little cups it was all down hill from here! It was. I got my picture taken at the bottom of the hill before I turned onto Bogard Road toward the finish. The last half mile or so is through a neighborhood and then onto a narrow path that takes you to the back of the high school and to the finish line. As I turned the corner, I saw Michele and Nicole cheering me on. They are my biggest fans! It put a smile on my face as I crossed the finish line. I thought I did pretty good this year. In fact I beat last year’s time by 43 minutes! Not bad for an old guy. In the final standings I finished in the middle of my age group. After the race was over Michele, Nicole and I grabbed some lunch and I signed up to volunteer as a timer in the pool for the little kids. I spent a couple hours watching the little one’s swim as hard as they could. They all were so competitive! A couple of them gave me a scare and I thought I would have to jump in and save them but they all did well and nobody had any issues. This is always a super fun event and I will be back next year. The organizers go out of their way to make it fun yet challenging and everyone is encouraging to everyone and nice. Maybe next year I will do better on the run. Hmmm. Why do people run for enjoyment anyway? You did awesome! So very proud of you.